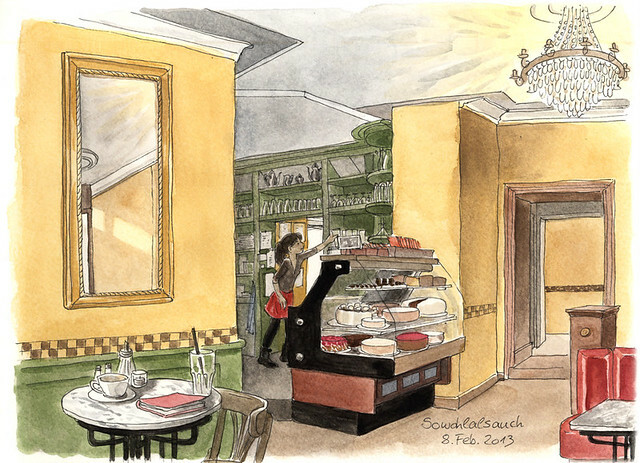 Sketch of view from SowohlAlsAuch Cafe. Brunch and sketching with Katrin, experimental play at Ballhaus Ost in the evening “The Black Glass” in English, troupe from Atlanta. Berlin offers some pretty good hot chocolate drinks. This was my afternoon treat at Cafe SowohlAlsAuch. Doing my best to make it look bigger than my head. Katrin sketching at SowohlAlsAuch. You can see how she draws a fairly reduced line drawing, then adds life by adding colour. Katrin sketching at SowohlAlsAuch. You can see the more final-looking colour now. Here is Katrin’s final drawing. Click on it to see her Flickr page. Berlin window shutters at a bar. So true. Seeing an experimental play at Ballhaus Ost in my neighbourhood. At Ballhaus Ost. Somehow, art is always around you here in Berlin, and it’s not always just the officially sanctioned stuff. This was just sitting in the stairway at the theatre. Apparently nobody will steal it either. Art lives here!